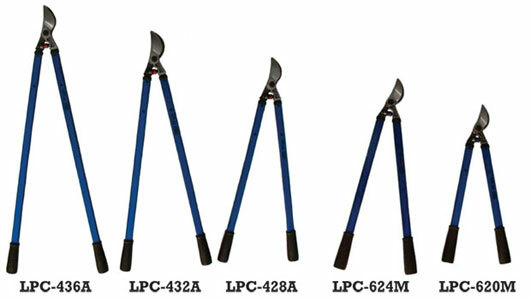 Incredible design and performance, this lopper has everything you want for professional use. The hook and blade hold the limb in the cut and allows the blade to roll through the cut with less effort. The hook and blade are made from special alloy steel that is heat-treated and tempered to produce an edge that stays sharp longer. The poly bumper is a great shock absorber and extremely durable. The trouble-free centerbolt is specially hardened and eliminates adjustment problems. Available with aluminum handles or wooden handles. The aluminum handles are made from a tough alloy that provides great strength with less weight. The wooden handles are made from hickory and have a classic feel and operation. Made in the USA. Deep hook and blade design prevents the limb from slipping and allows the blade to roll through the cut with less effort.